enable Guitar Tuner performs real-time tuning for a range of instruments, as well as presets for each instrument in a variety of styles. You can transpose, use common jazz and orchestra references or even enter your own custom frequencies for unlimited flexibility. 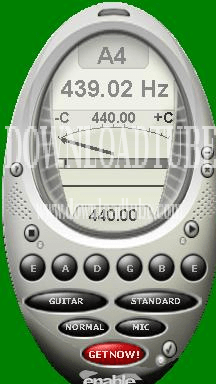 enable Guitar Tuner automatically determines your instrument / string's current frequency to high accuracy, and tells you the corresponding musical note. Use the transposition facilities to aid you in writing music or transcribing pieces you don't have sheet music for. Learn to "tune by ear" using the Play Tone feature, which generates the note you are trying to play while you tune to it.